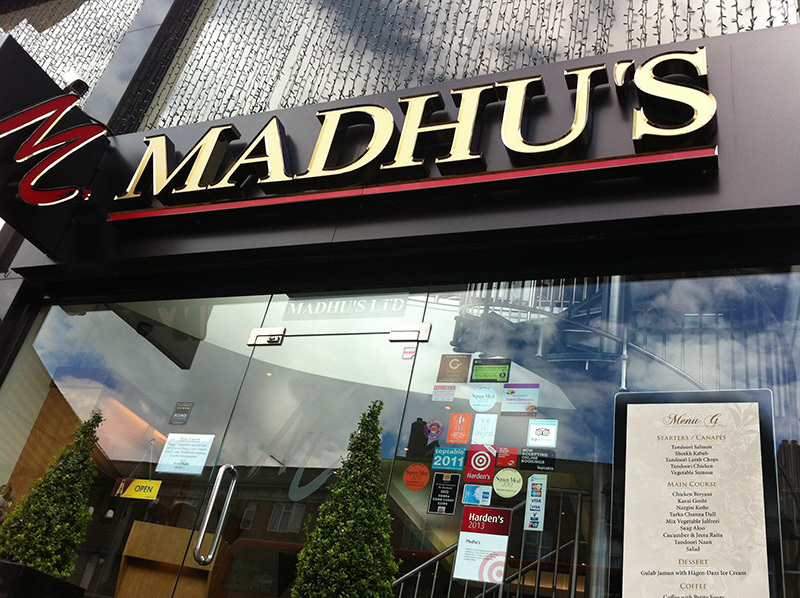 Madhu’s is one of the UK’s most prestigious restaurant brands with a passion for gourmet supremacy driving the restaurant to excellence. In addition to winning coveted awards and accolades such as the Cobra Good Curry Guides Best Restaurant award 2004, Madhu’s owner, Sanjay Anand was honoured to win Industry Personality 2004 at the BIBA’s and an MBE in 2007 for his services to the hospitality industry. Sanjay Anand MBE has also been appointed Brand Ambassador for Jaguar. 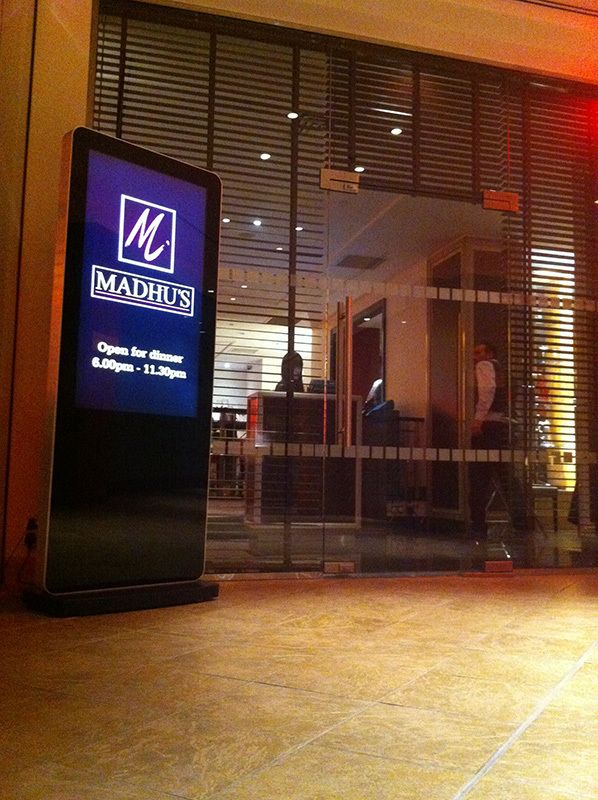 Madhu’s were looking for a digital menu board solution to compliment their brand image in their restaurants. They wanted the displays to be simple to use and required scheduling functionality to change content for various times of the day. 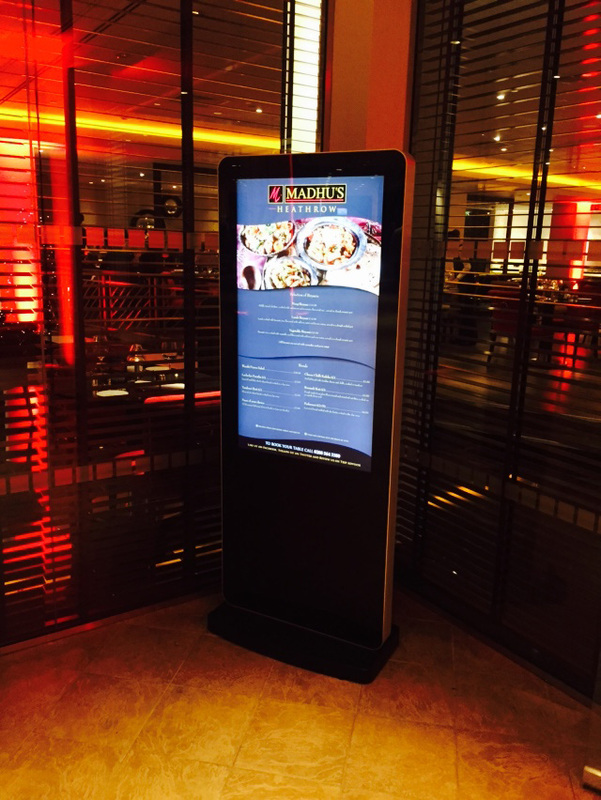 In Southall they required a front of house facing display on it’s own floor stand and in the Sheraton Skyline Hotel Heathrow, they required a totem that could sit in the walkway outside of the restaurant. They wanted the displays to be unbranded and provide a clean, elegant addition to their restaurants. After providing various options on types of digital menu board solutions and displays, Eclipse Digital Media provided a combination of 42″ totem and 42″ mounted on a floor stand to Madhu’s form the embed USB digital menu board range. These displays are updated locally using a USB key and provide the ability to set basic schedules to change their menu board content throughout the day.